At the Eight Three Eight Agency we thoroughly enjoy working with our clients and helping them transform and grow their business. We like to feature our clients and share a little more about their business! Avondale Development Group is a Fort Worth, Texas based, construction services company and is a leading builder in diverse market segments. The company has earned recognition for undertaking large, complex projects, fostering innovation, embracing emerging technologies, and making a difference for their clients, employees and community. The Avondale Development Group specializes in Land Development, Rural & Urban Development and Commercial & Industrial Development. Our projects have also included a back ground in Commercial Construction with projects such as Data Centers & Mission Critical Facilities, Multi-Family and Commercial Office Buildings. We pride ourselves in being different, state-of-the-art, innovative and inspiring. We mitigate challenges and solve problems. We are a dynamic group of extremely driven individuals with one goal in mind – matching our client’s creative vision and bringing it to life. We are an organically growing group of like-minded individuals motivated by our desire to provide the best of what this industry has to offer. Informed about emerging technologies, early adopters of innovative techniques, excited about vibrant pops of colorful energy, we share your dream of building a space that captivates imagination, exemplifies elegance and is enlivened with the spirit of your brand. 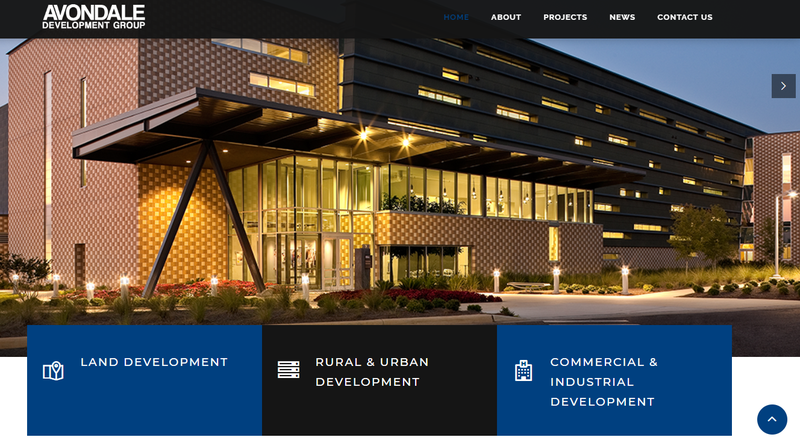 The Avondale Development Group remains an industry-leading provider in the US of general contracting, at-risk construction management and design-build services for public and private sector clients across the nation. Performing heavy civil and vertical construction, our teams build the unique structures and infrastructure that play an important role in how people live, work, learn and play in our communities. Our teammates have an instinctive passion to innovate that is fueled by a relentless curiosity, a drive to employ Lean practices and processes and the determination to find a better way. If you’re interested in learning more about how SEO can help drive more traffic and customers to your business, please feel free to contact us and we can perform a FREE SEO AUDIT or answer any questions you may have!